How can a virtual server be published and communicate while keeping its actual IP address hidden? A virtual server needs to be published and be able to send and receive packets without revealing its IP address to cloud consumers. The virtual server communicates with the addition of a middle layer component that changes its IP address. 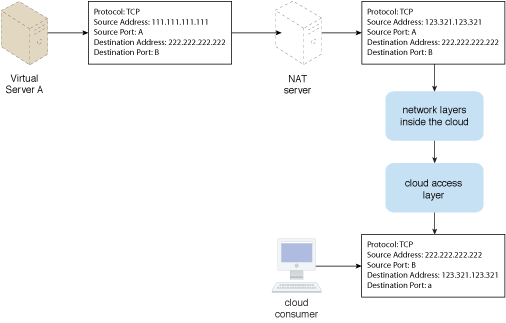 The solution is applied via the use of a NAT protocol (or a comparable component). The sender IP address that the customers see in the packet is not Virtual Server A’s real IP address. 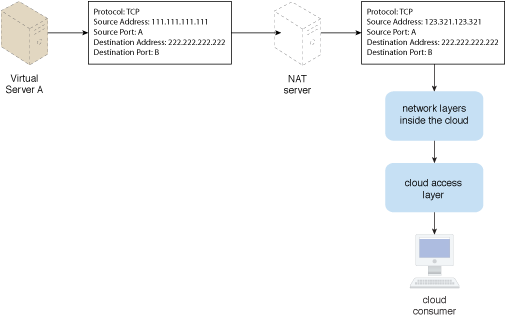 The packet is modified by the NAT server before it is sent back to Virtual Server A.